Coconut Rough Dairy Milk Chocolate contains milk chocolate and toasted coconut. I love cadbury, I love coconut. This combination is just perfect for me! The block is nice and big so you can enjoy it longer. The taste is not too sweet like other coconut chocolates, That makes this one my top favorite! Me and my family really like this bar alot! Best chocolate you will ever eat! 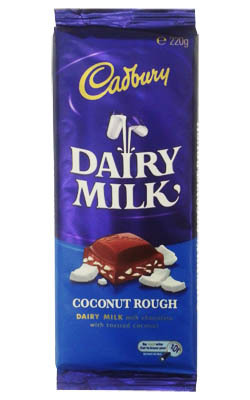 Cadbury's Coconut Rough is the best chocolate you will ever eat, with just the right amount of coconut to give it a little texture combined with Cadbury's dairy milk chocolate. This bar is even better than a large bounty but it's cadburys and it's delicious and addictive. If you like coconut, then you will love Coconut Rough chocolate. It is one of my favourite blocks ever! As a swiss,living abroad for a few months can be difficult without some good chocolate ! But this one is simply delicious and made my stay in Nz ! Simply love it !